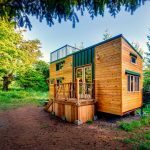 Over the last few years, tiny homes have become a rapidly-growing trend and are appealing to a wider range of people than ever before. Especially when that tiny home combines wheels and a log cabin! 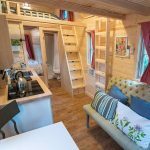 They provide people with so many options, from weekend getaways to full time towable homes with plenty of clever storage solutions. People are choosing to downsize, and take a ‘less is more’ approach to living, not because they can’t afford a luxury home in the suburbs, but because they believe there is more happiness in living a minimalist lifestyle. “The ability to simplify means to eliminate the unnecessary so that the necessary may speak.” – Hans Hofmann. 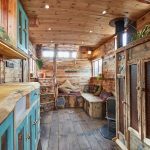 We have had such fun rounding up these 7 awesome log cabins on wheels. 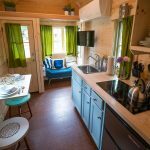 With the age of the tiny home being at its peak, there were certainly plenty to choose from, from converted horse boxes, to full traditional log cabins on wheels – what a treat we have in store for you! We will start the round up with this very clever cabin which was built to function completely off-grid and has its very own solar and rainwater harvesting system. There is 204 square foot of living space with an additional 179 square foot in roof deck and loft space. This particular version of the home is exquisitely designed with a wide range of wood being used which adds to a very rustic and cozy feel. 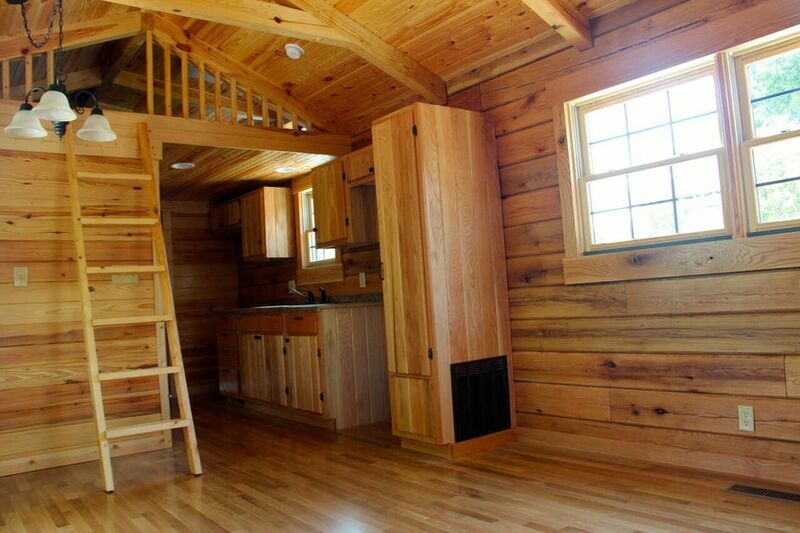 This cabin will sleep four people – two on the sofa sleeper and two in the queen bed situated in the loft space. 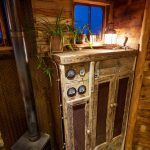 It has a composting toilet, propane heater, on-demand propane water heater, stove and fridge-freezer. 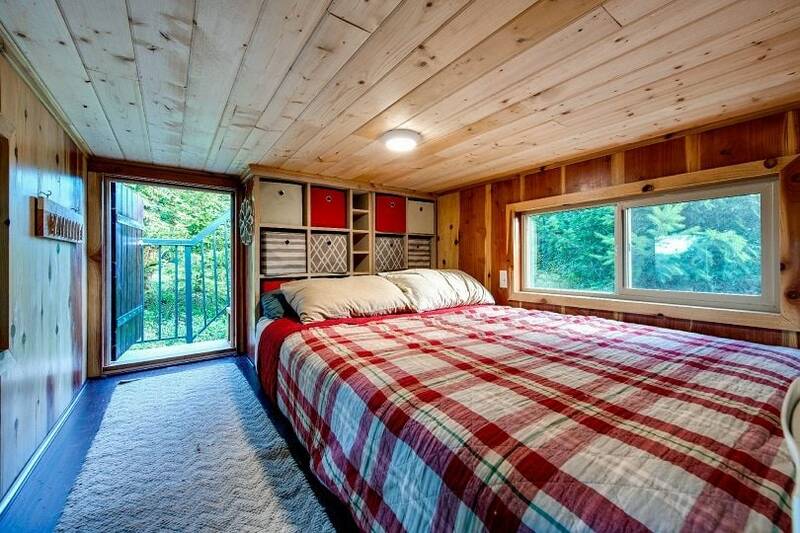 As always with tiny homes, storage is an important factor and this home has plenty. There is a small loft space on the opposite side to the bedroom, storage in the bedroom, plenty of storage on the ground floor. 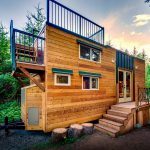 One of my favorite features of this tiny home is the beautiful rooftop decking. 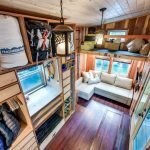 This is one of the most unique cabins on wheels that we are featuring in this roundup (and my ultimate favorite)! 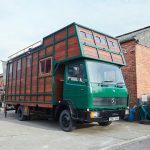 Helga was built by House Box (a play on words of horse-box, as the first project they completed was the restoration and conversion of an old horse-box)! 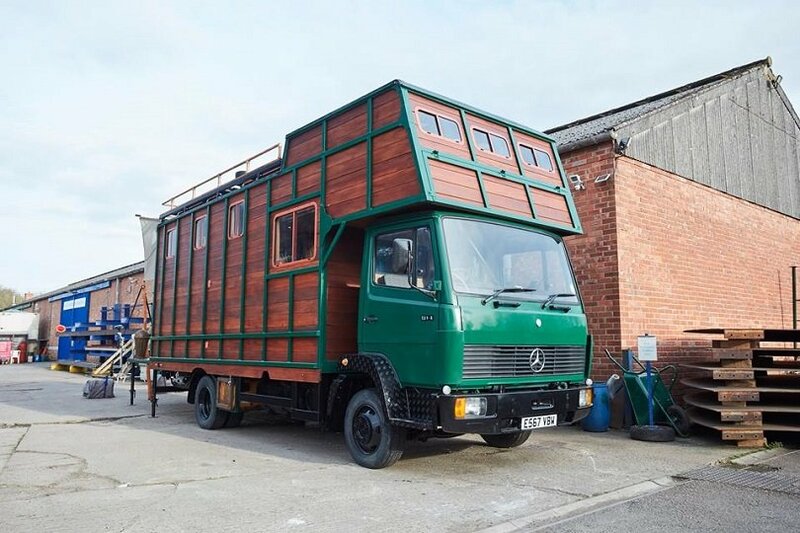 When the duo, who run House Box, received Helga (a Mercedes 814 Horse Box), she came complete with hay and horse poo. The pair stripped everything back and built it back up from scratch. The craftsman ship that has gone into this home is second to none; every single detail has been given their full attention. From the exquisite entrance door and porch, with a canvas awning above it, to the awesome wood work throughout the interior, to the custom made electrical sockets. It has an electrical hook up and also an LPG powered generator as a backup so they have off grid power! 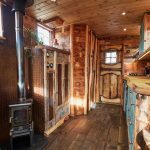 The horse box also has a stove, a great sized kitchen with top quality appliances and analog dials to show the battery voltage and the water lever in the tank. 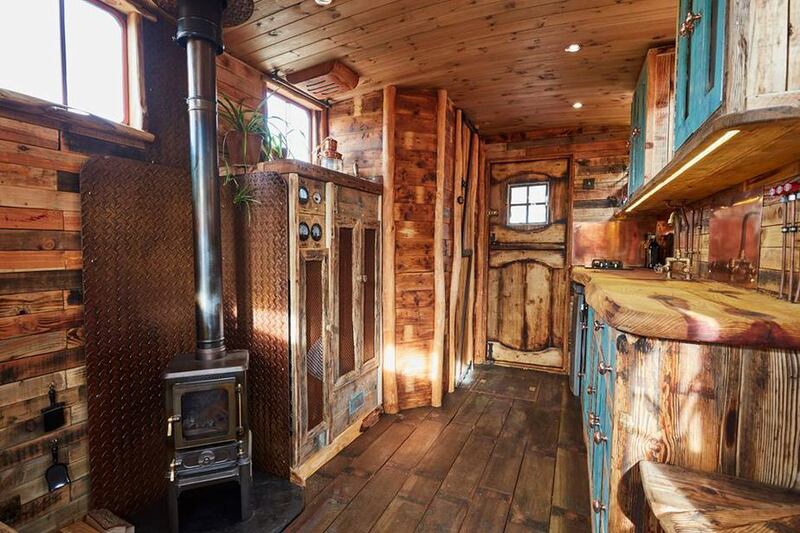 The next log cabin on wheels in our roundup was built from scratch in four months. It is the perfect getaway for fishing trips! 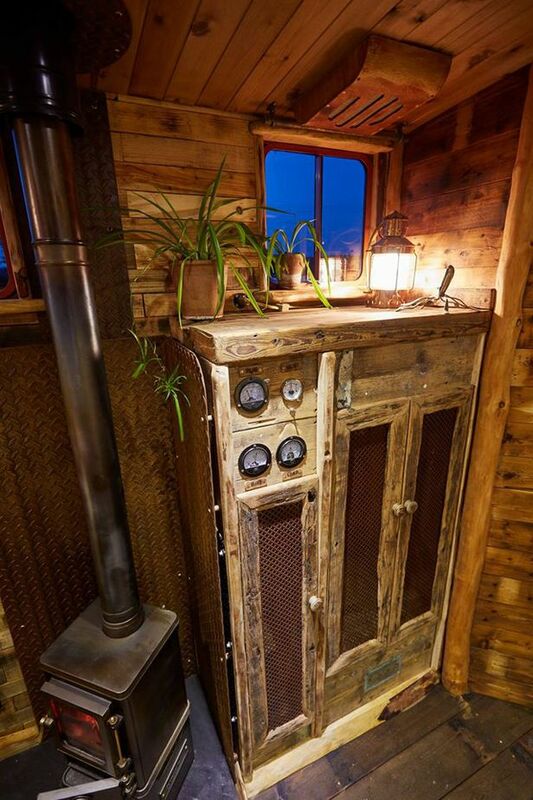 It started off as a small welding trailer and lots of antique and reclaimed wood was used to build it. An old melon box was used for the air conditioning framing and reclaimed barn wood was used for the siding and flooring. The steps were also made from antique steps, not only do they look great but they are also very practical as they can be chained up when travelling. The cabin has electrical wiring but no plumbing. Because of the small space inside, Mike – the designer, decided to just have a wash basin and a cooler. The interior is full of nice touches, including a pair of antler curtain hooks. Although the floor space inside is a tiny 6 x 8ft, it has everything you would need for a comfortable weekend away. The comfortable armchair turns into a single bed when turned around, there is a flatscreen TV, a large storage cabinet and all the shelving is made from cedar giving the cabin that delicious ‘real-wood’ smell. 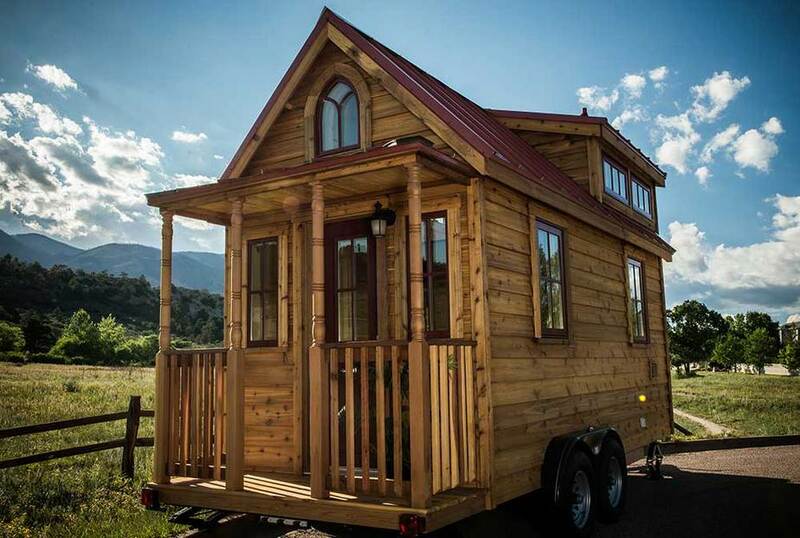 This cozy looking log cabin on wheels was designed by the largest manufacturer of Tiny House Rv’s in North America. 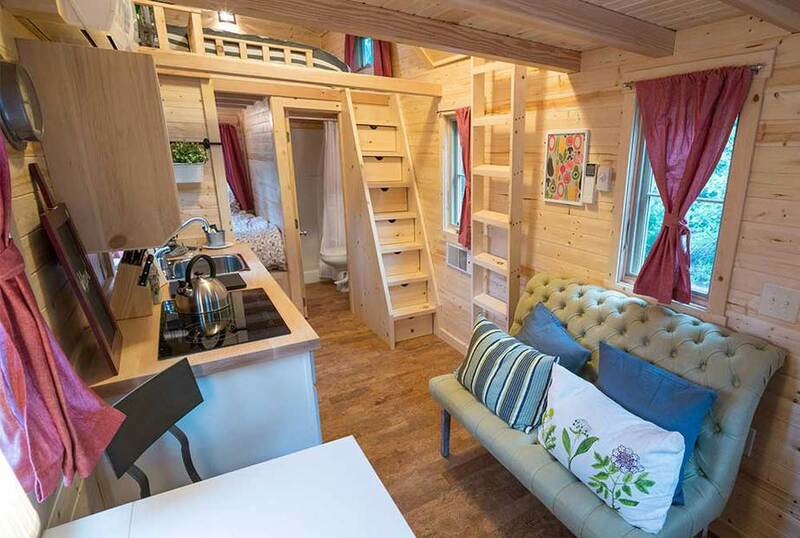 This specific model, Elm, was modeled on the company’s fist tiny home design. The space within the Elm is very flexible. There are a wide variety of different floorplans, with enough space for two bedrooms, or just one bedroom in the loft space to make the most of the ground floor space. 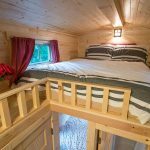 The cabin comes in two different sizes, 20ft and 26ft, the larger one offering up to 255+ square foot of space and sleeping up to 3 people. 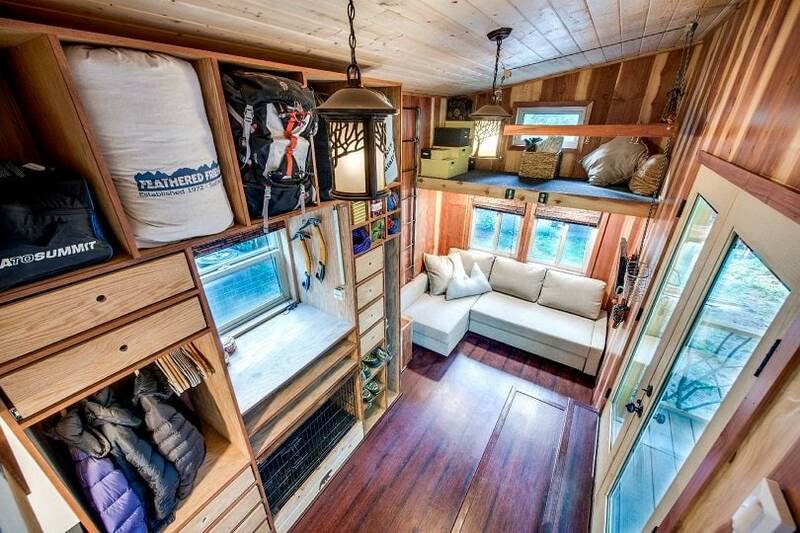 As with most tiny homes, the storage in this home is clever and plentiful. I especially like the stair storage which has a cupboard in each step. 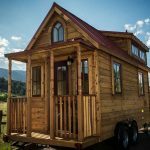 This tiny log cabin on wheels was designed by WheelHaus. It is built on a trailer chassis and is registered as an RV. The cabin has a unique shape which is created by the angled roof which is 17’ on one side, hence the name ‘The Wedge’. 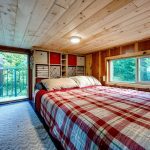 It has 400 square foot of floor space and includes an open plan living space with kitchenette, a bathroom, and a bedroom with plenty of space for a king sized bed. This innovative design combines high end finishes, with a rustic look. 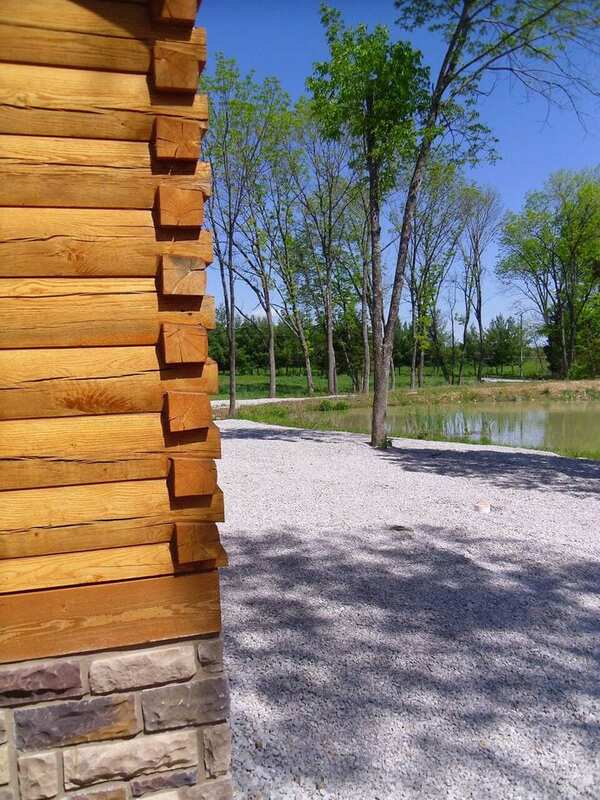 To create this look, weathered reclaimed fencing wood and rusty steel panels were used for the siding. Carrying this theme on into the interior, the cabin combines wooden flooring with concrete counter-tops and barn-style sliding doors to maintain the high end, yet rustic look. 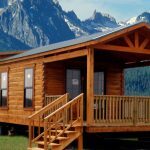 You’ll notice many of the other log cabins on wheels in this round up use siding or planks to create the exterior look of a log cabin. 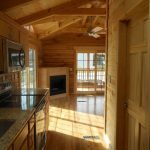 This log cabin on wheels is custom built using 6” wide x 8” tall oak logs. 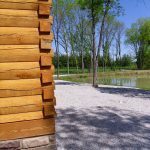 As you can see in the pictures, the craftsmanship of these cabins is outstanding; each corner is joined using a dovetail notch, possibly one of my favorite notches aesthetic wise. 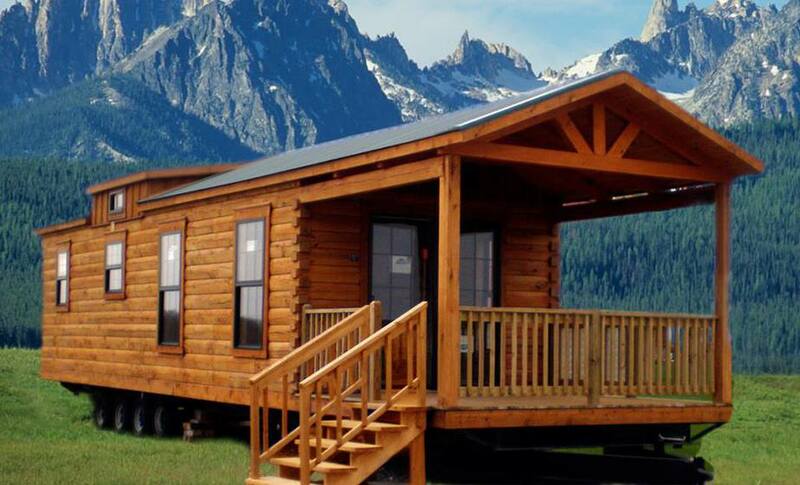 Although this log home is on wheels, it weighs around 43,000lbs so would need to be moved by a mobile home mover rather than being able to tow it yourself, the wheel, axles and tongue are also removable. 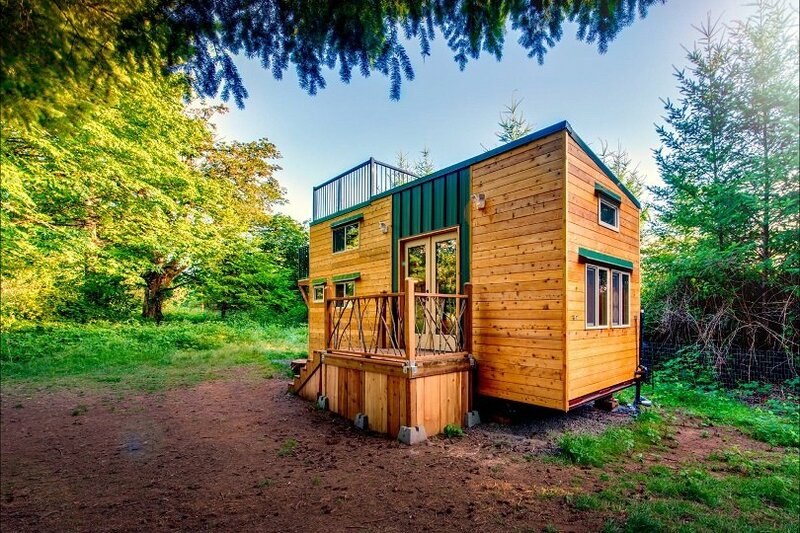 People have used this model as vacation cabins, rental cabins, boomerang child residence, a home for older relatives, offices, a man cave, an art studio and even for full time living! ‘hOME’ was built in just 4 months and cost under $23,000 to build ($35,000 including all the furnishing and appliances). 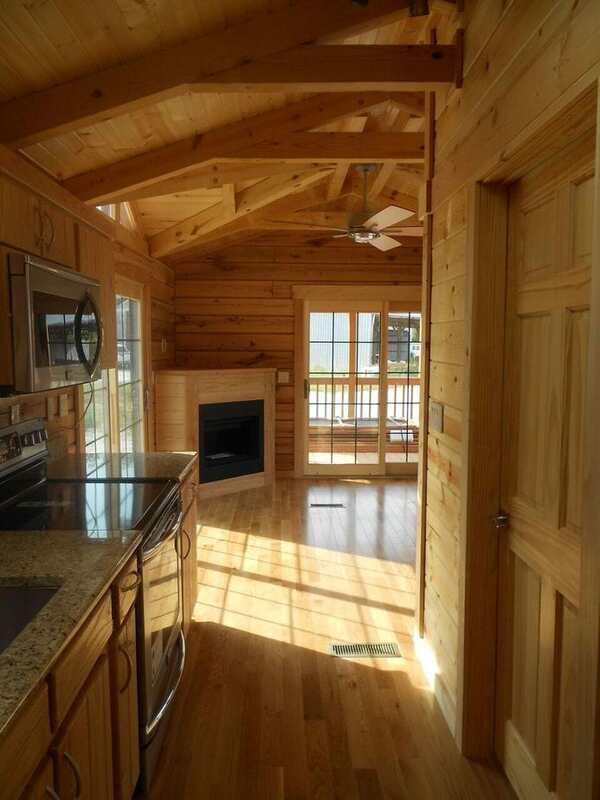 It has 221 square foot of floor space, and an additional 128 square feet of loft space. The couple who built this home opted for a shed roof instead of a gable roof which gives it a more spacious feeling. Plenty of windows, including glass in the doors to left as much light as possible into the home, adds to the spacious feel. Andrew Morrison says having that many windows brings the inside outside, and the outside inside! This log cabin has heaps of storage space, you’ll notice in the video that they don’t actually use it all and most of their cupboards are only half full. 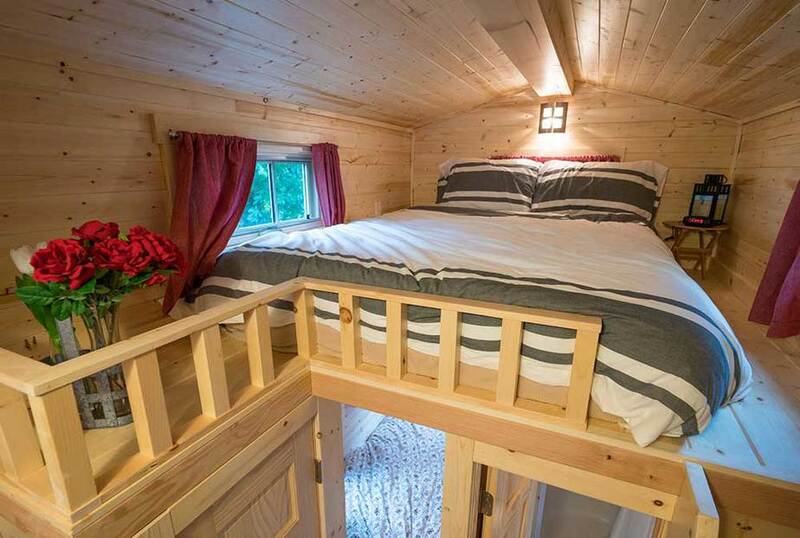 This cabin makes the most of every single nook and cranny. Their clever office space which operates on a completely paperless system with scanners to store bills and receipts also doubles as a dining area. There are two loft spaces, one for the bedroom and another which functions as a lounge with plenty of comfy cushions. 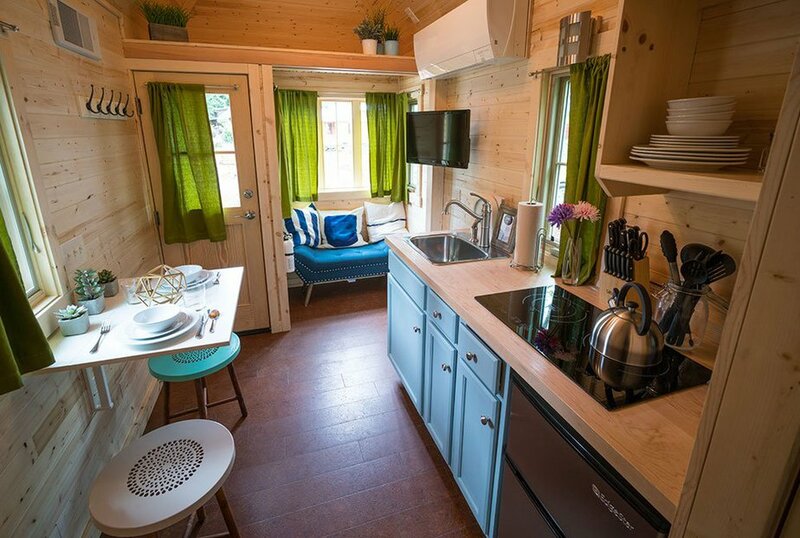 One of the unique things about this tiny home is the size of the kitchen. It is the same size as a regular kitchen; they have a large fridge/freezer, a 5 ring stove and a huge amount of storage. 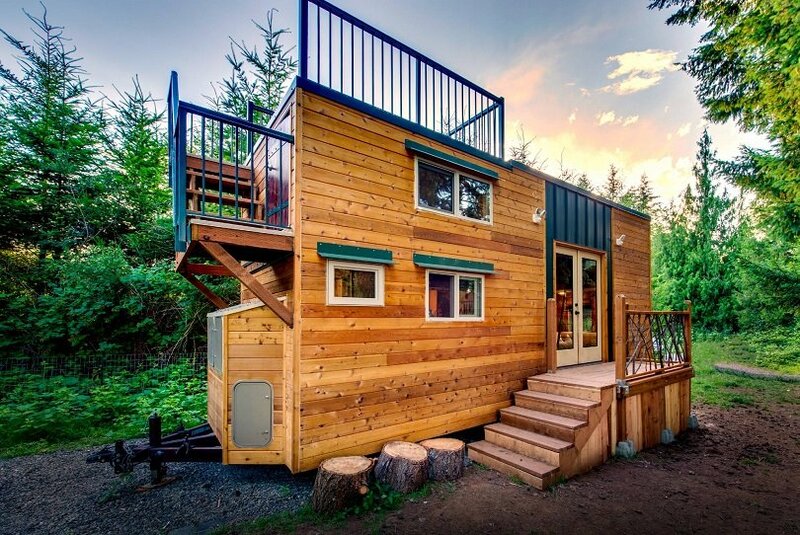 Another clever feature of this tiny log cabin is that is has stairs! Most tiny homes have ladders for loft access, but this home incorporates storage space with stairs. 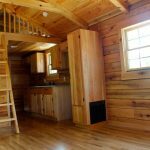 Living in a log cabin on wheels offers a practical living space, and every single one has plenty of storage, and all the necessities you need in life. Remember: ‘Simplicity is the ultimate sophistication’ – Leonardo da Vinci. Not only does living in a smaller house reduce the amount of clutter you can build up (or the amount of time you need to spend cleaning), but combine that with some wheels and you can go practically anywhere in the world – what’s not to love! Do you think you could live in one of these homes? 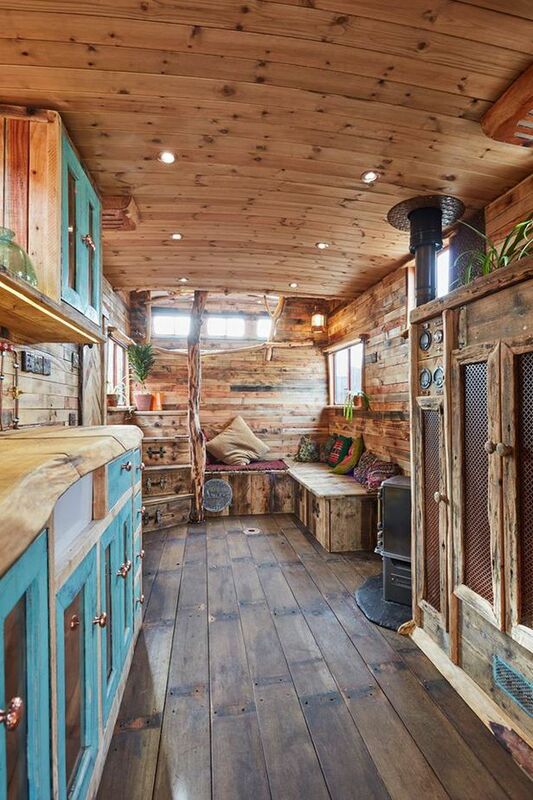 Which log cabin on wheels did you like the most? I would love to hear in the comments below.